The global wireless speakers market will post a growth CAGR of 17% & Bluetooth wireless speakers likely to grow significantly at CAGR of 10% during 2017-2023. CHICAGO, IL, UNITED STATES, July 9, 2018 /EINPresswire.com/ -- Arizton’s recent market research report on the global wireless speakers market identifies Alibaba Group, Alphabet (Google), Amazon.com, BEATS Electronics (Apple), Bose, HARMAN International (Samsung), Sonos, and Sony as the leading vendors that are likely to dominate the market during the forecast period. This research report provides detailed analysis of market segmentation by connectivity type (Bluetooth speakers and wi-fi speakers), by price range (low-end, mid-range, and premium), by end users (residential and commercial end-users), by distribution (retail and online), and by geography (North America, Europe, APAC, Latin America, and MEA). The development of wireless connectivity technologies such as Bluetooth and Wi-Fi to connect to smartphones, tablets, PCs, or any other dedicated wireless controller is propelling the growth of the global wireless speakers market. The introduction of sound reinforcement equipment that supports various technologies such Bluetooth Low Energy (BLE), and Basic Rate/Enhanced Data Rate (BR/EDR) will enable vendors to manufacture products that are flexible to the needs of the consumers in the global market. The launch of smart speakers that provide ease-of-use along with a taste of innovation is transforming the market. The rising awareness of wireless and remote speakers in the residential sectors of emerging nations will have a positive impact on the global market. The increasing per capita income, rising number of dual-income households, and growing spending on innovative devices are some of the factors augmenting the growth of the global wireless speakers market. The increasing adoption of smart homes and implementation of connected devices is contributing to the revenues in the global market. The proliferation of online retailers such as Amazon, JD.com, and eBay offering products from several key vendors will result in the evolution of the global market. The global wireless speakers market is projected to reach revenues of more than $27 billion by 2023, growing at a CAGR of approximately 17% during the forecast period. The report also provides market size details in terms of unit shipment during the forecast period. 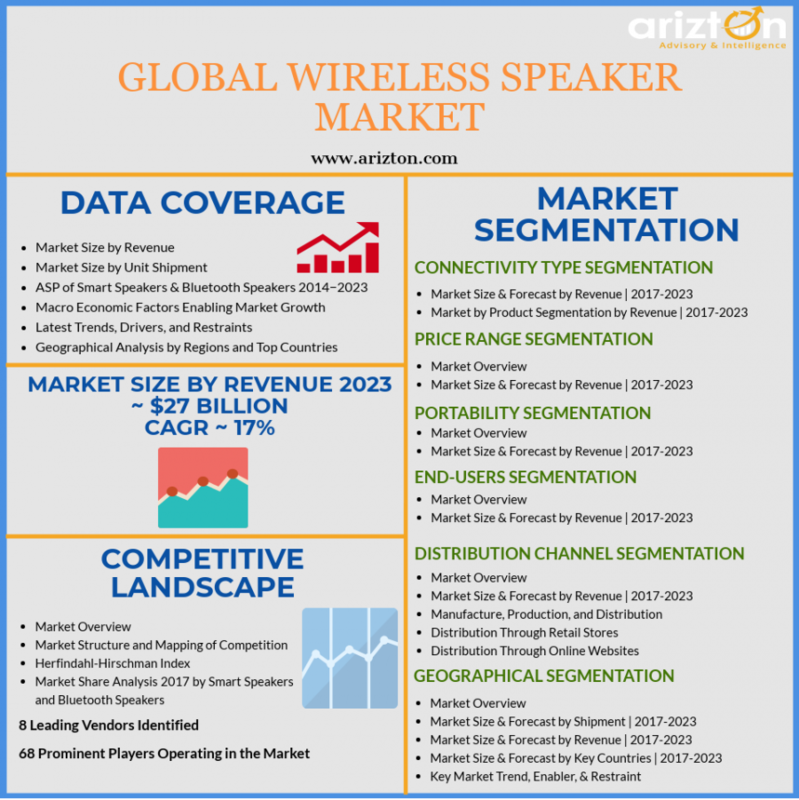 The global wireless speakers market is divided into five major segments that consist of connectivity type, price range, end-user type, distribution channels, and geography. The global wireless speakers market by connectivity type is segmented into Bluetooth speakers (traditional Bluetooth speaker, waterproof Bluetooth speakers, and rugged Bluetooth speakers) and wifi speakers (Wi-Fi only speakers, hybrid speakers, smart speakers, non-smart speakers, single-room speakers, and multi-room speakers). Bluetooth wireless speakers dominated a portion of the market share in 2017, growing at CAGR of over 10% during forecast period. The introduction of rugged and waterproof models is propelling the revolutionization of the wireless Bluetooth speaker segment in the global market. The leading vendors are focusing on introducing advanced battery technology that can run continuously up to 16 to 24 hours in a single charge to attract a large number of consumers in the Bluetooth wireless speakers segment. Furthermore, innovations in the Bluetooth technology, increasing awareness among end-users in developing countries, and decreasing ASP are some of the major factors leading to the growth of the Bluetooth wireless speakers segment in the global market during the forecast period. The geographical segment in the global wireless speakers market is classified into North America, Europe, APAC, Latin America, and MEA. APAC occupied a considerable market share in 2017, growing at a CAGR of approximately 34% during the forecast period. The increasing proliferation of low-end Bluetooth wireless speakers across China is propelling the growth of the APAC region in the global market. The introduction of smart speakers and Bluetooth wireless speakers in South Korea, China, and Japan is resulting in the increased revenues in the global market. The improving the quality of life and increasing per capita disposable income is resulting in the rising demand for Bluetooth wireless speakers in the APAC market. Moreover, the growing preference for differentiated and value-added products will help with the development of new wireless speakers and connected devices in the APAC market. The growing market of these innovative systems will create lucrative opportunities for leading Bluetooth wireless speakers and other system vendors in the APAC region in the global market. The availability of budgeted smartphones, high disposable income, and increased buying the power of the middle-class population across India and China will augment the demand for Bluetooth wireless speakers and other such devices in the APAC market. 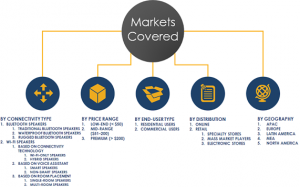 The global wireless speaker market by distribution channel is divided into retail (specialty stores, supermarkets, and hypermarkets or mass market players, and electronic stores) and online stores. The online stores dominated around half of the market share in 2017, growing at CAGR of more than 12% during the forecast period. The rapid increase in online sales of products such as Bluetooth wireless speakers by leading consumers such as Amazon, eBay, JD.com, and Alibaba is propelling the growth of the online retail stores in the global market. The ease-of-accessibility and convenience afforded by such channels are one of the primary factors attributing to the growth of the online stores in the global market. The availability of a wide range of products such as smart speakers, wireless Bluetooth speaker, and others will boost the demand across this segment in the global market. The geographical segment in the global wireless speakers market is divided into North America, Europe, APAC, Latin America, and MEA. North America occupied the majority of the market share in 2017, growing at a CAGR of approximately 14% during the forecast period. The increasing penetration of smart devices across North America will attribute to the growth of the market in this region. Smart speakers penetration in the US will boost sales during the forecast period. Amazon, Google, Apple, Sonos, and HARMAN Kardon are the leading companies operating in the North American market. The global wireless speakers market is highly concentrated, and the leading vendors control more than 60% of market share. The players are focusing on technological innovations, product upgrades, and refining the unique value proposition to sustain the intense competition in the global market. The companies are offering products with high functionality and designs to gain larger market share and attract new consumers. The increasing on focus on expanding businesses and distribution networks to emerging nations will result in higher revenues in the global wireless speaker market during the forecast period. The players in the market are competing on the basis of product or service extensions, technological innovations, and M&A activities. Other prominent vendors in the global wireless speakers market include Altec Lansing, Anker Innovations, AOMAIS, Apple, Artis, Axess, Avnera, Baidu, Bang & Olufsen, Beijing LingLong (JD.com), Boat Lifestyle, Braven, Creative Technology, Deutsche Telekom, DOSS, D&M Holdings (Denon), Edifier, Fabriq, Facebook, Forcovr (Shenzhen Guowei Security), iBall, iClever, ION Audio, Invoxia, Jam Audio, JONTER, KaKao, KitSound by Kondor, Klipsch Group, Koninklijke Philips, KT, Lenovo, LG Electronics, Libratone, LINE, Logitech, Micromax, Mobvoi, Monster Cable Products, Mpow, Mycroft AI, NAVER, NVIDIA, Onkyo & Pioneer, Orange, Panasonic, Photive, Plantronics, Polk Audio, Rock Space (RENQING TECHNOLOGY), Samsung Electronics, SHARKK, Sharp, SK Telecom, Skullcandy, SoundBot, Supersonic, TAGG, Telefónica, Tencent, The House of Marley, TIBO, Tribitaudio, VicTsing, Xiaomi, Yamaha, Yandex, and Zebronics.